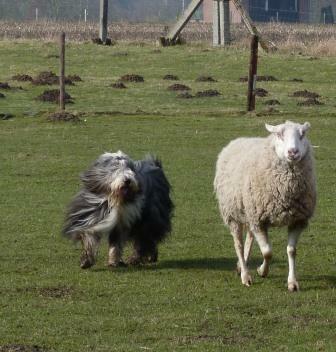 Who's practical sheep experience, like Jef's, really advantaged their dogs. As had Steve's Mr Lex, the Aussie! 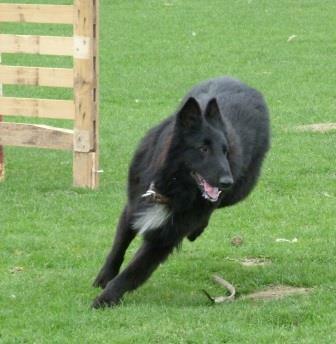 And his amazing kennel mate, last year the TERRIFYING pocket rocket, tamed enough to start work! 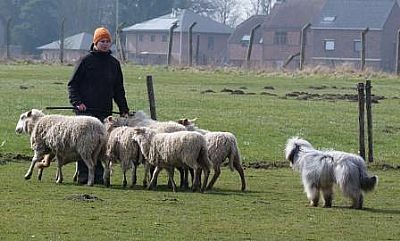 They just keep coming, so I thank you for your invitation, and congratulate you all on the way you use the facilities and the sheep to their very best advantage, offering your dogs the best in constructive training. 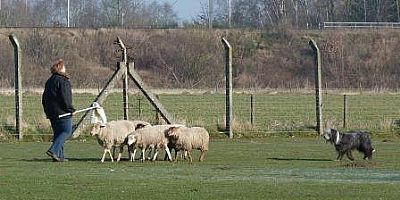 Remember ... Uncontested stops, square flanks, straight WALK ups to the SHEEP not yourselves ...You've got it cracked! 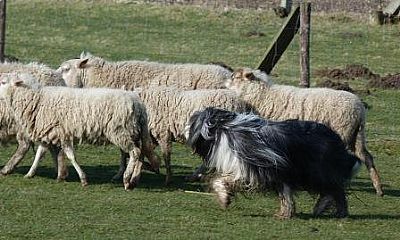 To choose videos of each dog working, taken and sent by Olga, scroll right to bottom of page and click on a link! There are LOTS to choose from! 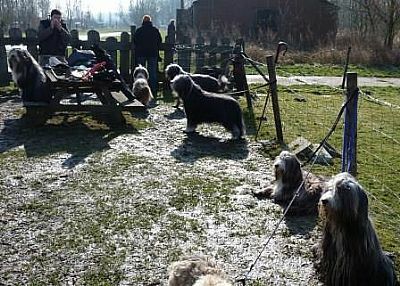 Belgian Beardies; My visit to Hassalt in March 2013. It snowed! James with owner, Luc, and me... thanks Olga! 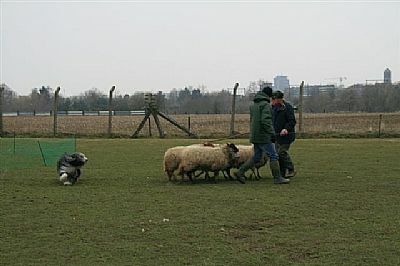 A big thankyou to the sheep, very good for taining on, clearly well managed by all who work with them! 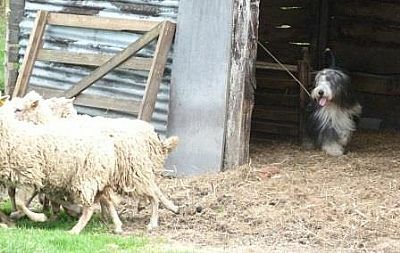 Loyd on sheep, lovely attitude! 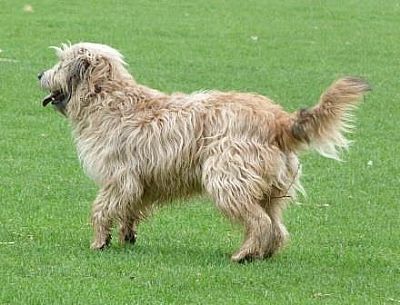 Brandy, 2 years old, willing, with presence and natural ability. Her mother, Enya, aged 10! 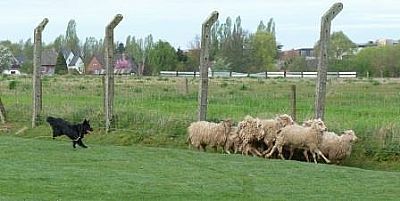 fast! Got more eye than I normally see in a K C beardie! 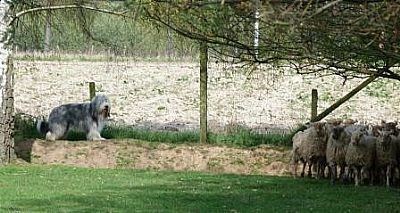 Olga's Dief, spends his summers on a barge, but his winters he herds! 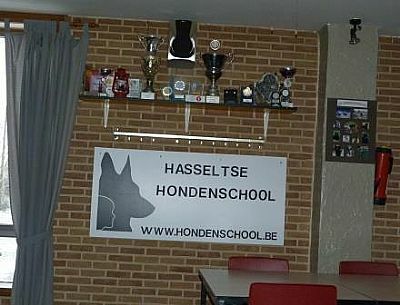 Yes, I loved the Dogschools! 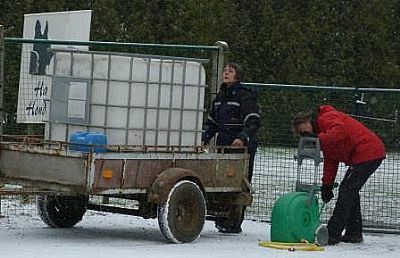 Warm canteens! 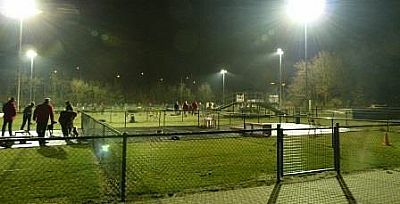 Floodlit, contained rings with all sorts of dogs and owners concentrating like mad! 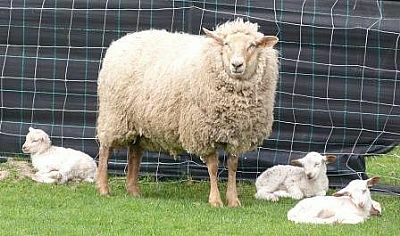 This was the one that had sheep! 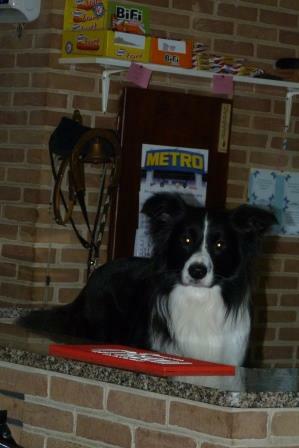 and a border collie called Izario who managed the bar! 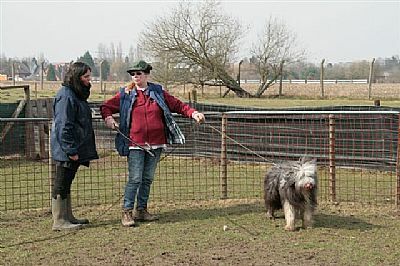 Heidi, my hostess, and Lennox, bred by Willy with Heidi's Farouche to Willy's Enid, one of four from that litter all working well on the course! 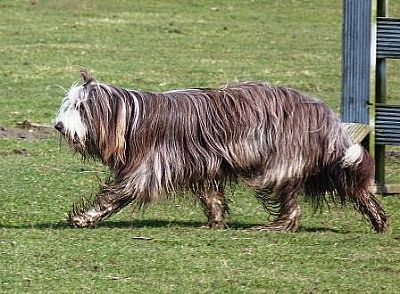 Not a beardie! 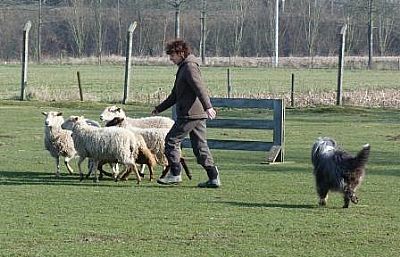 An Australian Shepherd called Lexi, with Steven, using the outside of the round pen to shape an outrun. 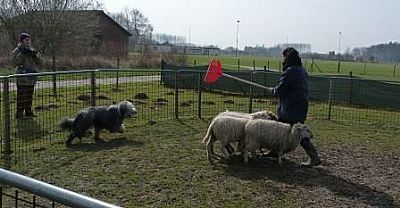 A couple more pics of Lexi on our Ausralian Shepherds page. 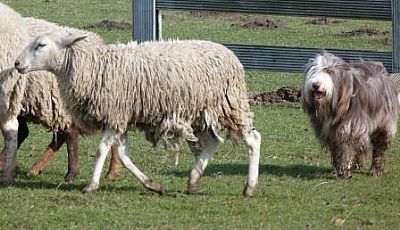 Another Farouche/Enid son, Lester, with Helga. 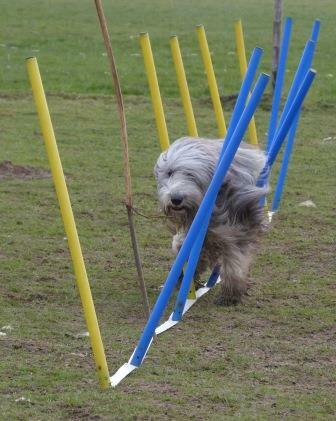 A very strong pushy dog! 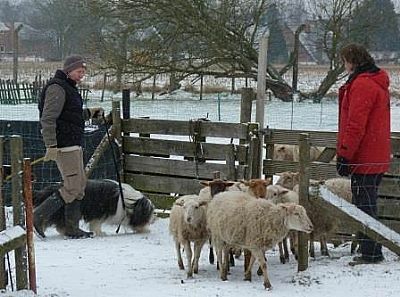 At the end of the session water has to be taken to the sheep paddocks by Willy and Olga. 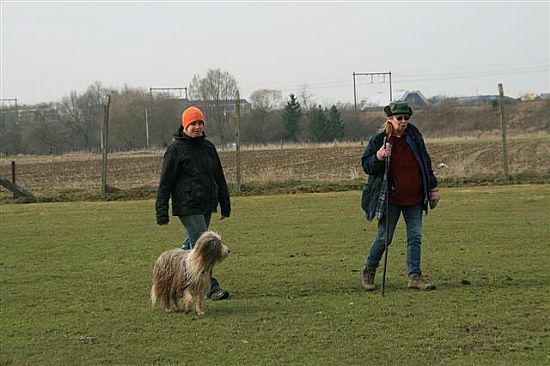 Remember, now is the time to reduce the body language and make sure your dog understands and takes the verbal command, EVEN WHEN HE/SHE disagrees with it! Good luck and many thanks for your invitation! Huge Thankyou to Olga for all these videos of all our work!